You might have seen a wiry, long-haired fellow wandering the streets of Duluth staring intently down at his phone over the last few weeks. That guy is me, the MIC’s intern for this summer. And that phone is actually a GPS device called a Trimble Juno. I’m using it to record the condition of every section of sidewalk in the city. With my trusty GPS in hand (which I call Lil’ Julie) I walk slowly through the streets recording three different bits of information for the Duluth Sidewalk Inventory. The first is the sidewalk condition rating. The options are Excellent, Good, Fair, and Poor. “Excellent” is basically for brand new sidewalks, immaculate and brilliant white. “Good” means that they don’t have any cracks and haven’t sunken or heaved. “Fair” means that there are cracks and vegetation growing up through those cracks. They generally have some sunken or tilted sections that leave small raised edges. “Poor” sidewalks are pretty rough. 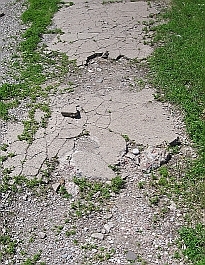 These have major surface defects—broken pavement, big holes and the like. The second criterion is the condition of the curb ramps. A curb ramp is that sloped portion of sidewalk on each corner. It allows disabled persons to transition from the street level to the sidewalk level and vice versa. These are rated along the same scale as the sidewalks. Some sidewalks don’t have curb ramps at all. In situations like that the sidewalks are almost entirely inaccessible to disabled persons. The third thing that I do is note any obstructions in the sidewalk. 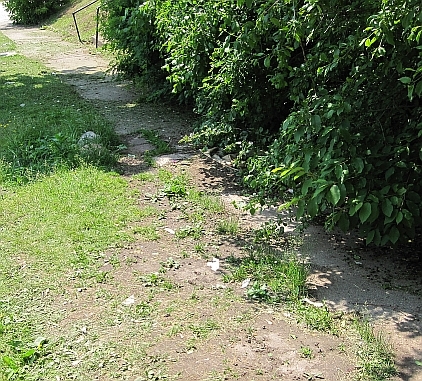 These generally consist of raised edges greater than ¾” and overgrown vegetation; though sometimes I do spot obstructions like raised utility access panels or signs in the sidewalk. It’s not an easy job (did you know there are over 400 miles of sidewalks in Duluth? ), but it really is important information to collect. With this data the city can target its resources to the spots that are in greatest need of repair. Lots of people, young and old, able-bodied and disabled persons alike, depend on these sidewalks for their own personal mobility and freedom. It’s good to know that the MIC’s sidewalk inventory works toward improving that. Do You Have Your Own Examples? Follow my progress on the MIC’s Facebook page. I’ll be posting updates on my progress all summer and adding pictures in the Unhappy Sidewalks of Duluth photo album. Do you have some real gems in your neighborhood? Some epic branches blocking your morning run? We’re also looking to identify sidewalk segments—in any condition, good or bad—that are important because they’re so heavily used. Take a picture and post it to our wall or email it to me. As discussed in our previous blog, approximately $45 million in federal funds are being programmed for Duluth area transportation projects for 2012-2015. The draft Transportation Improvement Program (TIP) spells out costs and timeframes for a total of 36 high-priority projects over four years and is now open for public comment. It seems we easily divide ourselves into those who drive versus those who ride the bus versus those who bike and so forth….an “us versus them” scenario. Well, in reality the transportation system—and the public spaces they are a part of—are used by people in a much more complex way. You might drive to your job or to shop, but there will always be some amount of walking involved, from car to final destination and back again. You might use the sidewalks for walking from place to place, but also for stopping to talk to your neighbor in a common space. You might ride your bike down the big hill but put it on a DTA bus for the trip back up. Looking through this lens, from the perspective of the users of the transportation system, you can see how this TIP has a major focus on how to really connect people in the safest and most efficient way possible. Preservation work on the two major bridges is needed to refurbish the Blatnik (I-535) in 2012 and the Bong (US Highway 2) in 2014. These TIP projects not only have the highest price tags and but also will receive the most attention—yes, just when the I-35 reconstruction “megaproject” is finished, there will be several more years of high-profile road construction projects, on the bridges this time! While the highway projects are devoted solely to cars and trucks, funding is also included to provide a safe alternative to driving. A paved pedestrian and bicycle pathway, running parallel to I-35, will connect the whole city from west to east. The Munger Trail will eventually extend all the way to the Lakewalk by constructing short segments of a new Cross-City Trail each year. The popular Duluth Lakewalk will in turn be extended from 60th Avenue East to Highway 61, and then out to Brighton Beach up the north shore. Funding for the Duluth Transit Authority will purchase new buses and provide operating support for both its regular route and STRIDE bus service. And thanks to recent Complete Streets efforts in Duluth, local street projects will take into account how the roads are being used by people every day and will be designed accordingly. The projects funded in the draft 2012-2015 Duluth area TIP balance the need to move vehicles efficiently with the needs of all people who use these public spaces, including those who utilize public transportation, those who traverse the roads by bicycle and those who are on foot. Which makes sense to us – what do you think? From now until Friday, June 24, the MIC is accepting public comment on the draft Duluth 2012-2015 TIP. No, this TIP is not a hot piece of insider advice. It’s a bureaucratic document, and admittedly it can be quite dry. But it’s much more important than it sounds, and we think it will be of interest to you as something that impacts your day-to-day life. Want to get a road repaved? A trail built? A new traffic signal on a route you take everyday? There’s a good chance that project has to make it through the TIP process first. TIP stands for “Transportation Improvement Program” and it’s an annual document that lists what local transportation projects will be receiving federal funding in the coming years. The current TIP (2012-2015) for the Duluth area contains a total of 36 projects planned to receive approximately $45 million in federal funds. In actuality, $45 million is just a portion of what’s being spent on transportation improvements in the region, with federal funds typically accounting for less than 25% of what’s spent on road improvements in Duluth in any given year. And yet this federal money can have a very catalyzing effect. It’s often this federal TIP money that incentivizes more comprehensive, and often more innovative projects. That’s because local governments are only required to match those funds 20 cents to the dollar. Or another way to say it: the federal government funds 80% of the project. This can make an improvement like the upcoming Cross City Trail (an exciting new link between the Munger Trail and the Lakewalk) a more feasible project for the City of Duluth to pursue. The other projects in this year’s TIP are aimed at preserving existing roads and bridges, as well as strengthening connections among alternative modes of transportation. You can take a look at the list of Duluth area projects for 2012-2015 and consider using Open MIC like a ‘virtual’ public meeting by leaving us any questions or comments you might have about the projects. Public comment period runs until Friday, June 24, 2011. I spotted these two ships earlier this season, conducting a maneuver to enable both boats to enter the Duluth-Superior harbor with only one lift from Duluth’s Aerial Lift Bridge. At first glance, the ballet these two ships performed looked like a demolition derby on a massive scale but turned out to be an impressive display of seamanship on a beautiful spring day. The result fits nicely with a plan by the City of Duluth to lessen wear and tear on the bridge by reducing the number of times the bridge lifts each day. The plan, recently approved by the US Coast Guard, was aimed at recreational boaters limiting them to entering only on the half hour from 7 a.m. to 9 p.m. from May 27 to the Tuesday after Labor Day. The system was tested last year and it reduced the number of lifts by over 1,000, a 23% reduction. This not only saves wear on the Aerial Lift Bridge but also reduces roadway congestion on Canal Park and Park Point. The bridge will still lift on demand for traffic like these freighters – but it was nice to see they are willing to do their part to preserve the iconic bridge.